Even if you're not a real dancer, step up your game and learn some moves! Bring a friend, make friends, and join in on the fun! Choreography emphasizes traditional Filipino dance, but also incorporates other styles. Practices are held on Saturday nights at Hallen Hall at Sacred Heart Parish, Lacey. Please contact our Social Activities Coordinators Yoly Valencia and/or Frank Ballon for more details. 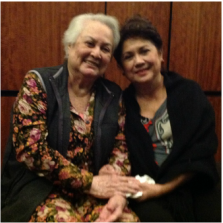 Filipino actress and comedian, Nova Villa treated us to an amazing show and presentation of her new film, "1st ko si 3rd" on September 13, 2015 at the South Puget Sound Community College performing arts center in Olympia. What a special and rare treat it was to not only watch an in-person performance and a film premiere, but the actress also participated in a meet-and-greet after the show. After touring all over the world, Ballet Philippines dazzled us with a rare and inspiring performance in Olympia on Friday, October 17, 2014, 7:30 PM at South Puget Sound Community College. 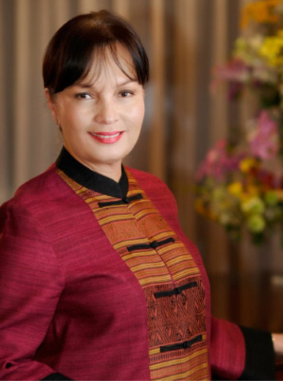 The company is led by Margie Morán-Floirendo, former Miss Universe and Miss Philippines. This event was hosted by FACSPS. Net proceeds for ad space in the ballet program went to Habitat for Humanity Philippines, ABS CBN Foundation International and the FACSPS scholarship fund for Thurston County area youth. For more information on Ballet Philippines, please visit their website: www.ballet.ph. Here is an article featured on the Republic of the Philippines Department of Foreign Affairs website that recaps their 2014 Los Angeles performance: "Ballet Philippines Receives Standing Ovation in Los Angeles"
On December 13th, 2013, the University of the Philippines Concert Choir graced our ears, eyes and hearts with an outstanding performance at River Ridge High School, co-hosted by Friends of Korus Foundation, Inc. The two-and-a-half hour program not only included Christmas-themed music, but it also featured a colorful array of Filipino-American song and dance from traditional to pop to Broadway. The repertoire included "Silent Night," "Hibang Sa Awit," "Sa Mahal Kong Bayan," a mash-up from Mamma Mia and "Seasons of Love" from the Broadway hit musical, Rent. An event such as this is a great way to expose people to our vibrant Filipino culture. So next time, be sure to not only invite your family members, but also reach out to friends, coworkers and anyone open to experiencing something new, educational and exciting! UPCC has earned the 2012 Aliw Awards' Lifetime Achievement Award and is widely acclaimed for being captivating, lively and inspiring. For more information, go to www.upconcertchorus.com. The Visiting Artists Program of FACSPS is a continuing program to offer as a gift to our new country America the lovely and exotic aspects of the arts and culture of the motherland, the Philippines. It is also our way of inculcating to the Filipino-American youth the heritage of their forefathers and to be proud of it as a vital component of the American mosaic. As early as 1983, FACSPS played host to visiting artists of the Filipiniana Dance Troupe and Chorale where they performed at Fabian Hall in Lacey. In 1985 FACSPS co-sponsored the show of the Barangay Folk Dance Troupe from the Philippines at the Pantages Theater in Tacoma. In 1991 a musical-play “Across Oceans of Dreams” was presented at the Evergeen State College by visiting thespians. The latter was a dramatic play about the bitter-sweet early days of Filipino immigration to America. The Visiting Artists Program of the FACSPS envisions a dynamic interchange between our youth and families and topnotch artists from the Philippines. In 1999 and 2001, there were the Philippine Ballet (PBT) Theatre gala performances at the Washington Center and at Pantages Theater, respectively. In the three days preceding the gala performance of the PBT in 2001, the artists rehearsed at the Johansen Ballet Schoolin Olympia where they interacted with American ballet students. The artists also taught students at the Jo Emery Ballet School in Tacoma. On the whole the parties benefited from the experience -- new acquaintances were made and relationships sustained. The artists learned about life in Washington State during their sojourn and while living with host families. The international awardees De La Salle University (DLSU) Chorale performed at the Washington Center in 2002. The DLSU Chorale likewise sang free of charge at different colleges that included the South Puget Sound Community College, the Saint Martin’s College and the Pierce College in Puyallup. The student-artists developed lasting cultural relationships with their counterparts in America. The performance of Visiting Artists teach the audience to appreciate the richness, beauty and exoticism of Filipino performing arts and music.. And with its appreciation, the people realize that art indeed is a common denominator to know more of one another. And as the audience are enthralled by the show, they begin to inquire, reach out, and allow a pristine fellowship to take root. And FACSPS is delighted to have contributed to such fellowship. 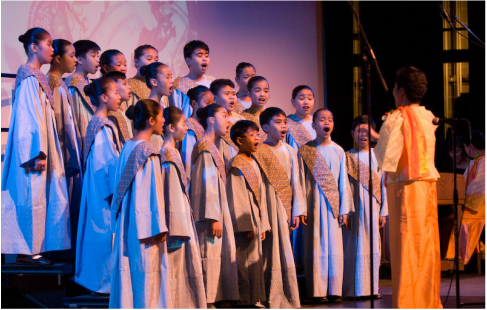 In April 2003, the University of the Philippines Concert (song and dance) Chorus performed in Olympia to very appreciative audience. The UPCC concert sponsored by FACSPS was their first engagement in an extensive American and European tour. “You will never know how versatile the human voice can be unless you listen to the De La Salle University Chorale.” Greek News Weekly, Athens. The Folk Dance Troupe has been with the Community since 1987 pioneered by Choreographer Nancy Garcia. The dancers are children of members who hone their artistic skills under the patient tutelage of Nancy. They have performed in numerous cultural and functions in schools and civic clubs in the Olympia, Yelm, Tacoma and Seattle areas. The students and the audience particularly are impressed by their beautiful and delightful folk pieces. 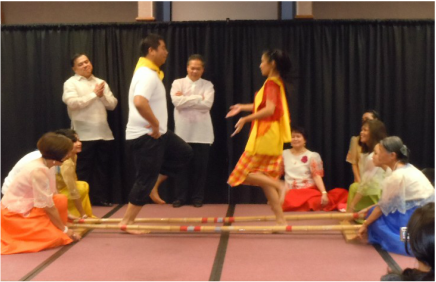 Their repertoire included Pandanggo sa Ilaw, Sayaw sa Bangko, Tinikling, Salakot, and many others. Innovative dance pieces are choreographed every year with the training of new and older batch of dancers. There were times when parents participated in various engagements, and they, too showed their skills in such pieces as the Balitaw, Rigodon, Tinikling, and the like. The change is noticeable in the poise and élan the student dancers carry themselves, in and out of the performance halls. All told the kids have matured with grace and enviable personality from elementary, high school and college days. And always, they look back at their development during their membership in the dance troupe. 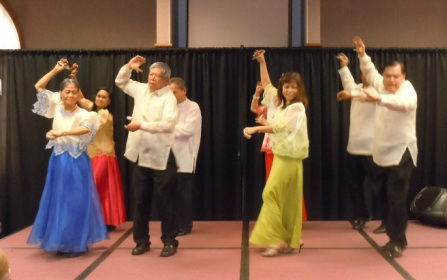 In college, some even taught other American students to dance Filipino ethnic pieces. Sally Roque took over from Nancy Garcia as Choreographer starting in 2001. Sally worked hard in filling the big shoes that Nancy left. In 2003, Tes Fernandus and Lucy Hochrine took the joint responsibility of further developing the folk dance troupe. The Choral Ensemble, in their colorful sequined attire, has performed in different programs sponsored by the Community in Olympia and Tacoma. The Ensemble normally opens gala shows of Visiting Artists from the Philippines with their unique rendition of the Philippines’ Bayang Magiliw and America’s Star-Spangled Banner. The Ensemble has a standing invitation to Chorale Director Boy Delarmente of the world-famous De La Salle University Chorale in Manila to spend his sabbatical period in Olympia to conduct the FACSPS Chorale. Boy has watched our chorus and was impressed with their self-thought talents in singing. Ms. Chelo Cox is our Choral Directress. The FACSPS has been presenting stage plays and theater pieces in the last six years in Olympia, and on several occasions in Tacoma, Seattle, Bellevue and other cities. The plays included Wanted a Chaperon, New Yorker in Tondo, Bannatiran, Condemned, Half an Hour in a Convent, The Right Way, Movie Artists, One More Chance, and others. The Community’s Mobile (Traveling) Theater Program with the premier presentation of the one-act comedy play “Movie Artists” at the Pagdiriwang Celebration on June 10, 2001 in Seattle was an outstanding success. The play was received by the enthusiastic crowd who laughed all the way through the show. The original play was written in English by Philippine National Artist Wilfredo Ma. Guerrero. However, the production staff has only the Tagalog version so the play was re-translated to English interposing it with native dialect and lingo, something that clicked with the audience which reminded them very much of bodabil in the homeland. The story revolves around a widower Felipe and his three daughters where one is on the verge of being a bomba star. Movie Artists was followed by other traveling stage plays including the latest, One More Chance in 2003. With the unprecedented interest of Filipino Americans and the general audience for plays of local color, the FACSPS will continue to produce dramatic shows whose objectives are to foster consciousness of Filipino culture and heritage especially with the youth, and to provide enjoyment in the performing arts – to the audience and to the artists. The plays, almost always, comedy or drama, impart lessons in ethics and morals.